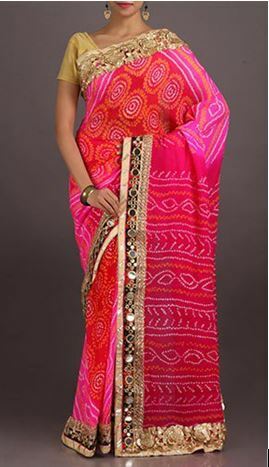 The rich diversity of Indian weaves is a fact well known, but more than what drama occurs on the loom, there is always the possibility of a richer look to dresses and costumes with the brilliant needlework that has also been part of the huge panorama of creativity of Indian art and craft. A stellar example of that same needlework is the mirror work tradition of Gujarat that is also called as sheesha. 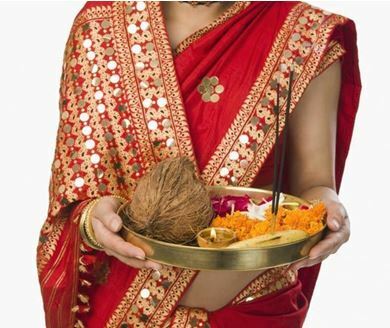 The historical backdrop that led to its development dates back to the 17th century when the Mughals arrived in India and most of the weavers and artisans began to produce articles more suited to the new gentry’s needs. What exactly is mirror work? Well, in reality, today while the glitter of mirrors may seem like real, the use of mica is more the norm. Just like real mirrors, mica is cut into tiny shapes and sizes that are most suited to the design and then worked on with embroidery. The area of Gujarat that specialized in mirror work, of course, is the Kutch region and the Kutchhi and Rabari tribes specialize in the intricate usage of mirror work. A traveler traversing the territories many centuries back wrote of the women of Kutch and their needlework that the needle is an instrument of a woman’s expression of her relationship with her religion and her surroundings- and without a doubt today, mirror work designs replicate the essential motifs that have carried on for ages giving it a timeless beauty that is vibrant yet ethereal. When you open up the folds of a mirror work saree, it almost feels like a small galaxy of twinkling stars has suddenly descended near you; such is the beauty of the tiny mirrors gleaming through that it’s hard to believe that something as hard, as difficult to work with has been used on fabrics as soft as chiffons, silks, georgettes, supernets, and crepes. What makes each design of each area unique is the choice of thread, the pattern, the motifs and the style of stitch. Here are some mirror work sarees in different fabrics that have given a modern twist to a craft taking it to quite another level. 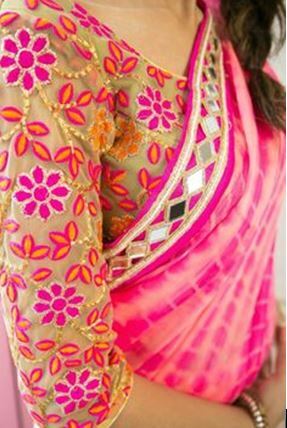 The saree below features mirror work done in different sizes, with a latticework kind of design binding them all together. Notice that the conventional blanket stitch is not the predominant one here. 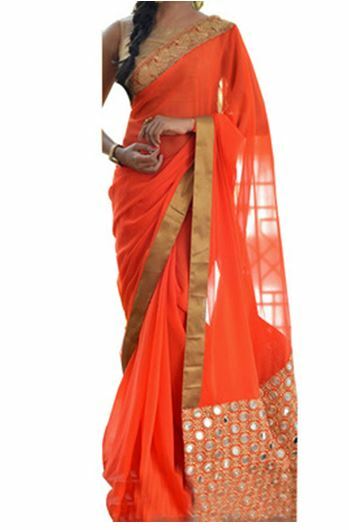 The border and the sleeves of the coordinating blouse making the saree come together in a resplendent manner. The saree below has diamond cut mirrors in a row –a thin border on a shibori dyed saree that has been worked on with a white blanket stitch –the base colour being deep pink, strikes the right chord. Silks play just the right kind of host for mirror work and here you can see how rich and light colors in their own way enhance the look of mirror work. 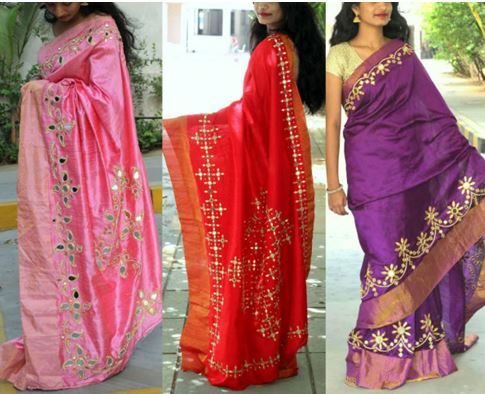 On each saree it is the placement of mirrors that makes the difference. While this need not be a traditional Gujarati saree with mirror work, the mingling of mukaish and mirror work has really made this a spectacular one. 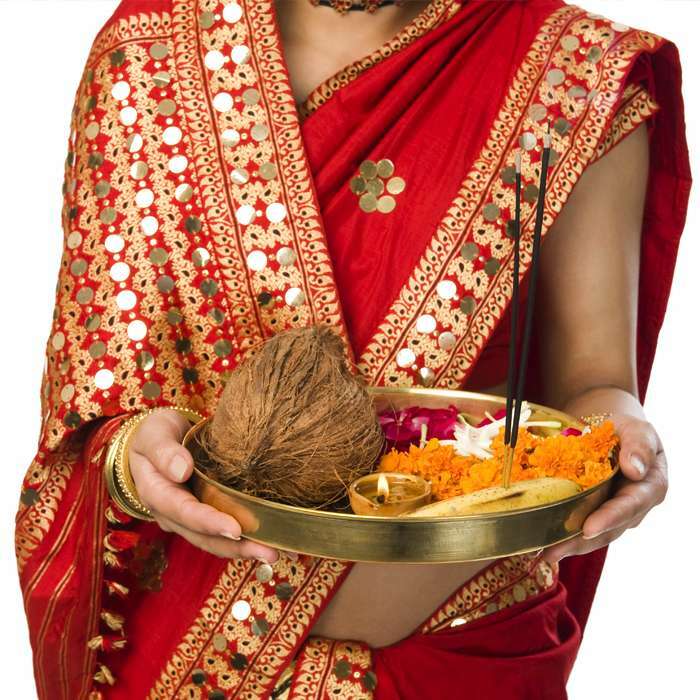 The typical look for Navratri of course is the mirror work saree worn in red. The brightness of the color and the festival fervor lends quite another look to the entire feel to the chain stitch worked saree, with the twinkling mirrors shining right through. For those who like to keep the feel of the saree light, the overload of mirror work on the pallu is another way to wear it. Many prefer mirror work in their kutchi choli, but having a pallu laden with stars is another way to make your look quite another thing.